The UC Davis Fire Department was established in 1917 as a student/faculty fire brigade in support of what at the time was the University Farm. The University of California, Davis is the home of the Aggies: go-getters, change makers and problem solvers who make their mark at one of the top public universities in the world. Originally UC’s “farm school,” UC Davis opened as a full-fledged campus of the UC System in 1908, UC Davis has been known for standout academics, sustainability, Aggie Pride, and valuing the Northern California lifestyle. These themes are woven into our institution's 100-plus-year history and our reputation for solving problems related to food, health, the environment, and society. Our 5,300-acre campus (8.3 square miles) is located in the fertile Sacramento Valley and adjacent to the city of Davis, a vibrant college town with a population of about 68,000. Sacramento, the state capital, is just over 10 miles away, and world-class destinations such as the San Francisco Bay Area, Lake Tahoe, and the Napa Valley are within a two-hour drive. The campus hosts more than 23,300 academic and administrative employees who support over 36,000 students – the third-largest enrollment in the UC system. 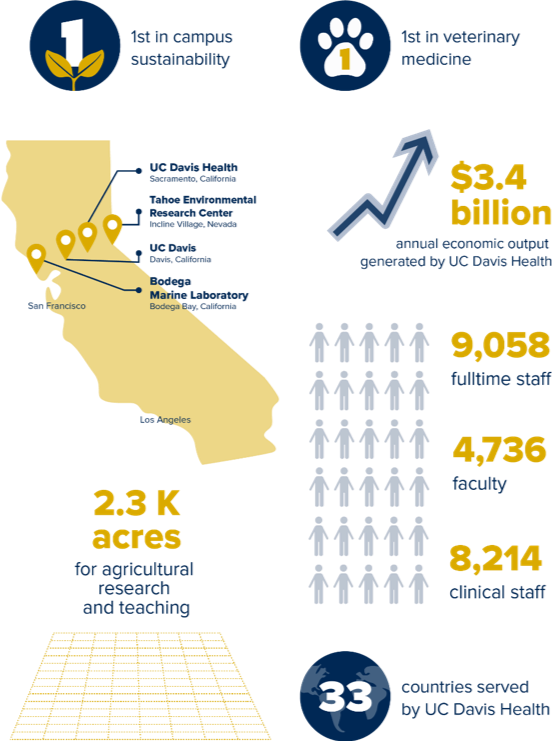 As the largest of the 10 UC campuses geographically, UC Davis enjoys tremendous opportunities to grow its academic and research missions. The need for fire protection on the UC Davis campus was first recognized in February 1916 following a series of costly fires. A faculty committee on fire protection was quickly convened, with School of Agriculture Dean Van Norman establishing a formal organization for fire protection at the University Farm soon thereafter. The campus’s first fire chief was Professor H.S. Beckett who by 1917 had formed the campus’s first faculty and student fire crews. Today, the department’s 59 employees (FT, PT, and students) respond to over 1,000 service calls annually. The department provides the community with a comprehensive mix of emergency response services including emergency medical services, fire suppression, basic and technical rescue, hazardous materials mitigation, public fire and EMS safety education, and domestic preparedness response. Research facilities and laboratories present unique hazards. More than 9,000 chemicals, compounds, and mixtures. Intellectual Property (IP) and research records. Nearly 8,000 annual campus events with 5.8 million attendees. Major infrastructure including freeways, railways, and utilities.